At Eco Outdoor, we have always been inspired by the belief that real beauty is imperfect and incomplete. And this idea informs the way we approach our products. We embrace the imperfections found in natural stone, timber and fabrics as we feel their character lies within these imperfections. To celebrate this belief, architects, designers, guests and friends this week joined us for an evening of Imperfect Living; an evening where we wanted to not only to mark the launch of our exclusive new outdoor furniture and linen ranges, but also to celebrate natural living, materials with integrity, the raw textures of life and simple, stylish outdoor living. With this in mind, we invited the inimitable Karen McCartney from Edit’d to be guest speaker on the night at our Waterloo showroom. 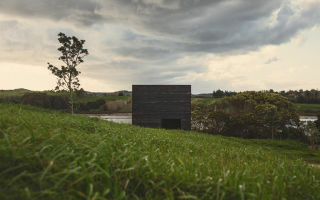 As well as possessing a wealth of experience in the areas of design, art and architecture, Karen’s appreciation of the attractiveness of flaws found in nature led to the publication of her stunning book, Perfect Imperfect: The beauty of accident, age & patina. So we felt she was the perfect fit for us. Karen brought our guests on an intimate journey of discovery and gave a rare insight into the inspiration behind the book, on which stylist Glen Proebstel and photographer Sharyn Cairns were co-authors. She cited the collaboration between the three and art director Tracey Lines, as well as their collective aesthetic, as the root of the success of the project. With immersive visuals from the book projected onto a screen in our showroom, Karen referenced Jacqui Fink, who handcrafts striking and bespoke knitted installations; photographer and designer Martyn Thompson and the exclusive access he granted to allow his mesmerising loft in Soho, New York to be shot, as well as Nicola Tassie’s studio – which houses unfinished and neglected pieces on shelves which then became the basis of a new body of work. With more fascinating images taken from the book, Karen described the thinking behind the work of Roman and Williams, the design studio that maintains that interior spaces should never be ‘done’ or completed, but that they evolve with time and are ever-changing. Gasps of ‘oohs’ and ‘aahs’ were clearly audible from the crowd when Karen moved on to speak about and display images of Nectar Efkarpidis and the dazzling and somewhat anarchic visuals contained in his Canberra apartment. Founder and creative pioneer Efkarpidis revealed to Karen how graffiti added uncertainty and a feeling of unresolved, thereby encouraging further impromptu acts by designer friends. Karen’s remarkable offering provided the highlight of an evening which was book-ended by a warm, relaxed atmosphere of guests catching up and sharing their passion for architecture and design. Providing a beacon of light as the sun crept below the Sydney skyline, people had been welcomed to the event by a fire pit containing a roaring blaze, placed on the footpath outside the entrance to the showroom. Once inside, they were then treated to the delights of ‘imperfect’ martinis – cocktails created onsite by mixologists using the handcrafted Distillery Botanica gin, which utilises the method of effleurage to extract the purest flavours. 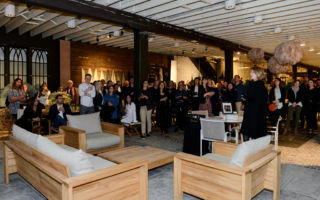 Most took time to take in the displays of our new designer outdoor furniture and linen ranges, when they weren’t spellbound by the wonderfully over-sized cheese board and wine installation at the centre of the showroom. Before making their way home for the evening, guests were invited to toast their own Black Pantry marshmallows over the fire pit outside the front entrance, a very appropriate way to end a perfect imperfect evening. Perfect Imperfect: The beauty of accident, age & patina, by Karen McCartney, Sharyn Cairns & Glen Proebstel is available to purchase in our Sydney and Melbourne showrooms and online from Amazon. You can see more work by Karen McCartney here. View more of Sharyn Cairns photography here. And Glen Proebstel’s portfolio can be found here.